Increased expression of the immunosuppressive cytokines, TGF-β1 and IL-10, is a hallmark of the advanced stages of cutaneous T cell lymphoma (CTCL), where it has been associated with suppressed immunity, increased susceptibility to infections, and diminished antitumor responses. Yet, little is known about the transcriptional regulation of TGF-β1 and IL-10 in CTCL, and about their function in regulating the CTCL cell responses. In this article, we show that TGF-β1 and IL-10 expression in CTCL cells is regulated by NF-κB and suppressed by bortezomib (BZ), which has shown promising results in the treatment of CTCL. However, although the TGF-β1 expression is IκBα dependent and is regulated by the canonical pathway, the IL-10 expression is IκBα independent, and its inhibition by BZ is associated with increased promoter recruitment of p52 that characterizes the noncanonical pathway. TGF-β1 suppression decreases CTCL cell viability and increases apoptosis, and adding exogenous TGF-β1 increases viability of BZ-treated CTCL cells, indicating TGF-β1 prosurvival function in CTCL cells. In addition, TGF-β1 suppression increases expression of the proinflammatory cytokines IL-8 and IL-17 in CTCL cells, suggesting that TGF-β1 also regulates the IL-8 and IL-17 expression. Importantly, our results demonstrate that BZ inhibits expression of the chemokine receptor CXCR4 in CTCL cells, resulting in their decreased migration, and that the CTCL cell migration is mediated by TGF-β1. These findings provide the first insights into the BZ-regulated TGF-β1 and IL-10 expression in CTCL cells, and indicate that TGF-β1 has a key role in regulating CTCL survival, inflammatory gene expression, and migration. Enhanced TGF-β1 and IL-10 expression by T regulatory cells is a hallmark of the advanced stages of cutaneous T cell lymphoma (CTCL), especially mycosis fungoides and the leukemic variant, Sézary syndrome (SS) (1–5). The increased levels of IL-10 and TGF-β1 have been associated with suppressed immunity, increased susceptibility to infections, and diminished antitumor responses in CTCL patients (6–10). In addition, the advanced stages of CTCL are associated with the increased expression of the chemokine receptor CXCR4 and its ligand CXCL12, also known as stromal cell–derived factor 1 (SDF-1); both CXCR4 and CXCL12 have been linked with the increased CTCL cell proliferation, skin recruitment, and accumulation (11–14). At the transcriptional level, both IL-10 and TGF-β1 expression is regulated by the transcription factor NF-κB (15–21). However, compared with antiapoptotic and proinflammatory genes, the transcriptional regulation of immunosuppressive genes by NF-κB is much less understood. The majority of genes involved in inflammatory response are regulated by NF-κB canonical pathway that is IκBα dependent and involves predominantly p65 and p50 subunits. In contrast, lymphocyte development is regulated by noncanonical pathway, which is IκBα independent, and activates complexes containing mostly RelB and p52 (22, 23). Binding of the individual NF-κB dimers, and other transcription factors and coregulators, to different κB sites provides the transcriptional selectivity of NF-κB responses (24–26). The NF-κB DNA binding activity is constitutively increased in CTCL cells and has been associated with the high CTCL cell survival and resistance to chemotherapy (27–32). There is no effective strategy to prolong survival of patients with advanced stages of CTCL; thus, novel therapeutic strategies are needed (33–38). Bortezomib (BZ; Velcade, PS-341) is the first Food and Drug Administration–approved proteasome inhibitor that has shown remarkable antitumor activity in the treatment of patients with multiple myeloma (MM) (39, 40). BZ has shown promising results also in patients with relapsed or refractory CTCL (41–44). However, the precise molecular mechanisms are not fully understood (45, 46). BZ has been originally developed as an inhibitor of the IκBα-dependent canonical pathway, resulting in the inhibition of NF-κB–dependent antiapoptotic genes in cancer cells (39, 40). However, we have recently shown that the proteasome inhibition also induces nuclear translocation and accumulation of IκBα, which has a promoter-specific effect on the regulation of NF-κB–dependent genes, depending on the subunit composition of NF-κB proteins recruited to the different κB binding sites (47–50). In this study, we report that both TGF-β1 and IL-10 expression in CTCL cells is suppressed by the BZ-mediated proteasome inhibition. However, whereas the TGF-β1 expression is regulated by the IκBα-dependent canonical pathway, the IL-10 expression is IκBα independent, and its inhibition is associated with the increased promoter recruitment of p52 that characterizes the noncanonical pathway. In addition, TGF-β1 suppression induces apoptosis and IL-8 and IL-17 expression in CTCL cells, indicating that TGF-β1 regulates survival and proinflammatory gene expression in CTCL. Importantly, our results indicate that TGF-β1 mediates the CXCL12/CXCR4-dependent CTCL cell migration, and suggest that BZ inhibits the CTCL migration, at least partly, by inhibiting TGF-β1. Purified Abs against human IκBα (sc-371), NF-κB p65 (sc-372X), p50 (sc-7178X), cRel (sc-71X), RelB (sc-226X), p52 (sc-848X), CXCR4 (sc-9046), TβRI (sc-398), TβRII (sc-17792), and lamin B (sc-6216) were purchased from Santa Cruz Biotechnology (Santa Cruz, CA). Recombinant human TGF-β1 (240-B-002) and CXCL12 (350-NS-010) proteins, TGF-β neutralizing Ab (MAB1835), and the corresponding isotype control Ab (MAB002) were from R&D Systems (Minneapolis, MN). Purified polyclonal Ab against lactate dehydrogenase (LDH; 20-LG22) was from Fitzgerald Industries International (Concord, MA), and actin Ab was from Sigma-Aldrich (St. Louis, MO). HRP-conjugated anti-rabbit, anti-mouse, and anti-goat secondary Abs were from Santa Cruz Biotechnology (Santa Cruz, CA). BZ was from ChemieTek (Indianapolis, IN). All other reagents were molecular biology grade and were from Sigma-Aldrich (St. Louis, MO). CTCL cell lines, Hut-78 (ATCC TIB-161), H9 (ATCC HTB-176), and HH (ATCC CRL-2105) cells, derived from peripheral blood of patients with SS and non–mycosis fungoides/SS aggressive CTCL were obtained from the American Type Culture Collection (ATCC, Rockville, MD) and used between the passage numbers 10 and 15. PBMCs from healthy human volunteers were purchased from Zen-Bio (SER-PBMC-200; Research Triangle Park, NC). Cells were maintained at 37°C in RPMI 1640 medium, supplemented with 10% heat-inactivated FBS and 2 mM l-glutamine, 100 U/ml penicillin, and 100 μg/ml streptomycin, in a humidified atmosphere with 5% CO2. Before cell treatment, cells were seeded (5 × 105 cells/ml) in 6-well plates and grown 24 h at 37°C with 5% CO2. BZ was dissolved in DMSO and stored at −80°C. An equivalent volume of DMSO was used in all experiments as a solvent control. Cell viability was measured by using trypan blue exclusion. Human IκBα (sc-29360), TGF-β1 (sc-44146), TβRI (sc-40222), TβRII (sc-36657), and nonsilencing (sc-37007) small interfering RNAs (siRNAs) were obtained from Santa Cruz Biotechnology. Before transfections, cells were seeded (5 × 105 cells/ml) into a six-well plate and incubated in a humidified 5% CO2 atmosphere at 37°C in antibiotic-free RPMI 1640 medium supplemented with 10% FBS for 24 h. For each transfection, 50 nmol (final concentration) siRNA was used. Cells were transfected with TransIT-siQUEST transfection reagent (Mirus Bio, Madison, WI) as described previously (50). After transfection, fresh RPMI 1640 medium supplemented with FBS and antibiotics was added, and cells were incubated for 48 h.
Whole-cell extracts (WCEs) and cytoplasmic and nuclear extracts were prepared as described previously (47–50) and separated on 12% SDS gels. Contamination of nuclear and cytoplasmic fractions by cytoplasmic and nuclear proteins, respectively, was determined by Western analysis using LDH and lamin B as specific markers as described previously (47–50). To determine equal protein loading, we stripped and reprobed membranes with anti-actin Ab as described previously (50). Total RNA was isolated by using RNeasy mini kit (Qiagen, Valencia, CA). The iScript one-step RT-PCR kit with SYBR Green (BioRad, Hercules, CA) was used as a supermix, and 20 ng RNA was used as template on a Bio-Rad MyIQ Single Color Real-Time PCR Detection System (BioRad). The primers used for quantification of TGF-β1, IL-10, IL-8, IL-17, CXCR4, and actin mRNA were purchased from SA Biosciences (Frederick, MD). Chromatin immunoprecipitation (ChIP) analysis was performed as described previously (51). In brief, proteins and DNA were cross-linked by formaldehyde; cells were washed and sonicated. The lysates were centrifuged (15,000 × g, 10 min, 4°C), and the supernatant extracts were diluted with ChIP dilution buffer and precleared with Protein A/G Agarose (Santa Cruz, CA) for 2 h at 4°C. Immunoprecipitation was performed overnight at 4°C, with p65, p50, cRel, RelB, or p52 Abs. After immunoprecipitation, the samples were incubated with Protein A/G Agarose (1 h, 4°C), and the immune complexes were collected by centrifugation (150 × g, 5 min, 4°C), washed, and extracted with 1% SDS-0.1 M NaHCO3. After reversing the cross-linking, proteins were digested with proteinase K, and the samples were extracted with phenol/chloroform, followed by precipitation with ethanol. The pellets were resuspended in nuclease-free water and subjected to real-time PCR. Immunoprecipitated DNA was analyzed by real-time PCR (25 μl reaction mixture) using the iQ SYBR Green Supermix and the Bio-Rad MyIQ Single Color Real-Time PCR Detection System (Bio-Rad). Each immunoprecipitation was performed at least three times using different chromatin samples, and the occupancy was calculated by using the human IGX1A negative control primers (SA Biosciences, Frederick, MD), which detect specific genomic ORF-free DNA sequence that does not contain binding site for any known transcription factors. The results were calculated as fold difference in occupancy of the particular protein at the particular locus in comparison with the IGX1A locus. Primers for TGF-β1 and IL-10 were as follows: TGF-β1: forward, 5′-ATCTCCCTCCCACCTCCCT-3′ and reverse, 5′-TCCTGCTCGTCTCAGACTCTG-3′; IL-10-κB1: forward, 5′-CTATGGAATTGAGGCTCTTGC-3′ and reverse, 5′-GCAGAAGCAGTTAGAGGTGC-3′; IL-10-κB2: forward, 5′-CAGCCAATGTGGAATTCCC-3′ and reverse, 5′-GTGGCCAAGGCTCAAACAC-3′; IL-10-κB3: forward, 5′-TCCCACTCACTTCACGCTG-3′ and reverse, 5′-AGATGGAGGGCATTTCCAGT-3′. Apoptosis was evaluated with a cell death detection ELISA kit that quantifies release of nucleosomes into the cytoplasm (Cell Death Detection ELISAPLUS; Roche, Indianapolis, IN) as described previously (47). The assay was performed at the indicated time points as per the manufacturer’s instructions. TGF-β1, IL-10, and CXCL12 cytokine release were measured in cell culture supernatants by commercially available ELISA kits (R&D Systems) as previously described (50). Migration assays were performed using 8-μm pore polyester Transwell inserts (Corning, Tewksbury, MA) equilibrated in PBS buffer. Cells were precultured 12 h in serum-free RPMI 1640 medium, counted, resuspended (5 × 104) in 100 μl serum-free RPMI 1640 medium containing 0, 10, or 100 nM BZ, or 300 ng/ml TGF-β neutralizing Ab or IgG1 isotype control, and added to the upper chamber. RPMI 1640 medium (650 μl) containing 10% FBS was added to the lower chamber with or without 50 ng/ml CXCL12 (12). Migration was allowed to proceed for 6 h at 37°C in 5% CO2 incubator. The inserts were then removed, washed with PBS, fixed 10 min in 100% methanol, and stained for 30 min by using 2% crystal violet. After cells were stained, the inserts were washed with water and allowed to dry before counting the migrated cells. Migrated cells were counted in five random fields. Results are expressed as migration index, which represents the ratio between the numbers of migrated treated and untreated cells. The results represent at least three independent experiments. Numerical results are presented as means ± SE. Data were analyzed by using an InStat software package (GraphPad, San Diego, CA). Statistical significance was evaluated by using Mann–Whitney U test with Bonferroni correction for multiple comparisons; p < 0.05 was considered significant. Because we have previously shown that proteasome inhibition has a promoter-specific effect on the expression of NF-κB–dependent genes (47, 50), we wanted to determine whether BZ regulates expression of the immunosuppressive cytokines TGF-β1 and IL-10 in CTCL cells. To this end, we first measured TGF-β1 and IL-10 release from CTCL Hut-78 (Fig. 1A, left panel), H9 (Fig. 1A, middle panel), and HH cells (Fig. 1A, right panel) incubated 24 h with increasing BZ concentrations. All three CTCL cell types release considerable amounts of TGF-β1, and 100 nM BZ, which approximately corresponds to the clinically used BZ concentrations (52), significantly inhibits the TGF-β1 release from all three CTCL cells (Fig. 1A). In contrast, IL-10 is released only by Hut-78 and H9 cells, but not HH cells, and 10 and 100 nM BZ concentrations significantly inhibit the IL-10 release (Fig. 1A). Proteasome inhibition suppresses TGF-β1 and IL-10 expression in CTCL cells. (A) ELISA assay of TGF-β1 and IL-10 release measured in cell culture supernatants of Hut-78 (left panels), H9 (middle panels), and HH (right panels) cells incubated 24 h with increasing BZ concentrations. (B) Real-time RT-PCR analysis of TGF-β1, IL-10, IL-8, and IL-17 mRNA levels in Hut-78, H9, and HH cells treated 24 h with increasing BZ concentrations. (C) Real-time RT-PCR of TGF-β1 and IL-10 mRNA levels in Hut-78, H9, and HH cells treated 0, 6, 24, and 48 h with 10 nM BZ. Values in (A)–(C) represent the mean ± SE of four experiments. Asterisks denote a statistically significant (*p < 0.05) change compared with control untreated (UT) cells. Ten and 100 nM BZ also greatly reduced the mRNA levels of TGF-β1 and IL-10 in all CTCL cells (Fig. 1B). To ensure that the decreased expression of TGF-β1 and IL-10 in BZ-treated cells was not caused by the BZ-induced apoptosis (47), we have analyzed, as a control, expression of the NF-κB–dependent proinflammatory genes IL-8 and IL-17. In contrast with the decreased mRNA levels of TGF-β1 and IL-10, the expression of IL-8 and IL-17 was significantly increased in CTCL cells incubated with 10 and 100 nM BZ (Fig. 1B), demonstrating specificity of BZ effect on the expression of NF-κB–dependent genes. The BZ inhibition of TGF-β1 and IL-10 gene expression in all three CTCL cell types was time dependent (Fig. 1C). Our previous studies have demonstrated that proteasome inhibition induces nuclear translocation and accumulation of IκBα, which has a promoter-specific effect on the inhibition of NF-κB–dependent genes (47–50). Thus, we wanted to determine whether the BZ-induced inhibition of TGF-β1 and IL-10 expression is IκBα dependent. Hut-78 cells were transfected with control and IκBα-specific siRNA, treated with BZ, and analyzed for IκBα, TGF-β1, and IL-10 expression. In agreement with our previous observations (47–50), 10 and 100 nM BZ induced the nuclear translocation and accumulation of IκBα in cells transfected with control siRNA (Fig. 2A, top panel). Transfection with IκBα siRNA reduced both the cytoplasmic and the nuclear IκBα levels in BZ-treated cells (Fig. 2A, top panel, bottom gel, exposed together with the control siRNA gel). However, whereas the TGF-β1 mRNA levels were increased in cells transfected with IκBα siRNA (Fig. 2B), the IL-10 mRNA levels were not affected by IκBα suppression (Fig. 2C). These data indicated that the BZ-mediated TGF-β1 inhibition is IκBα dependent, whereas the IL-10 inhibition is not regulated by IκBα. TGF-β1 inhibition is mediated by IκBα, whereas IL-10 inhibition is IκBα independent. (A) Western blotting of cytoplasmic (CE) and nuclear (NE) extracts prepared from Hut-78 cells transfected with control nonsilencing (top gel) and IκBα-specific (bottom gel) siRNA, incubated 24 h with increasing BZ concentrations, and analyzed by using IκBα Ab. Both gels were transferred to a membrane and exposed together at the same time. The purity of cytoplasmic and nuclear fractions was monitored by using LDH and lamin B Abs. The membranes were stripped and reprobed with actin Ab to confirm equal protein loading. (B) TGF-β1 and (C) IL-10 mRNA levels in Hut-78 cells transfected with control and IκBα siRNA, and treated 24 h with increasing BZ concentrations. Values represent the mean ± SE of four experiments; asterisks denote a statistically significant (*p < 0.05) change compared with cells transfected with control siRNA. The dependence of TGF-β1 expression on IκBα has suggested that TGF-β1 is regulated by the canonical NF-κB pathway. Using TFSEARCH program, we have identified NF-κB-binding site (GGGGACGCCC) located +94 from the transcription start site in human TGF-β1 promoter (Fig. 3A). Even though we have recently shown that p65, p50, and RelB NF-κB subunits are localized in the nucleus in CTCL cells (50), ChIP analysis using p65, p50, RelB, cRel, and p52 Abs has demonstrated that only p65 and p50 are recruited to the TGF-β1 promoter in Hut-78 cells (Fig. 3B). BZ significantly decreased the p65/p50 recruitment (Fig. 3B), correlating with the BZ-reduced TGF-β1 expression (Fig. 1). Together with the data demonstrating that the TGF-β1 expression is IκBα dependent (Fig. 2B), these results have indicated that the TGF-β1 expression in CTCL cells is mediated by the classical canonical pathway (Fig. 3C). TGF-β1 is regulated by the NF-κB canonical pathway in CTCL cells. (A) Schematic illustration of NF-κB binding site in human TGF-β1 promoter, and the ChIP primers used in the ChIP assay. (B) Recruitment of NF-κB p65, p50, cRel, RelB, and p52 subunits to TGF-β1 promoter in Hut-78 cells treated 24 h with 0, 10, and 100 nM BZ was analyzed by ChIP and quantified by real-time PCR. Data are presented as the difference in occupancy of each protein between the TGF-β1 promoter and the IGX1A (SA Biosciences) negative control locus and represent the mean ± SE of four experiments. Asterisks denote a statistically significant (*p < 0.05) change compared with control (no BZ) cells. (C) Model of the regulation of TGF-β1 transcription in CTCL cells. The human IL-10 promoter contains three putative NF-κB binding sites: κB1 (GGGAATTTGCCC; -18,337), κB2 (GGGGAATTCC; -5,734), and κB3 (GGGGAAACCC; -1,496) (Fig. 4A). p65, p50, and RelB were all heavily recruited to the κB1 site, and this recruitment was decreased by BZ. Interestingly, BZ concomitantly increased the p52 recruitment (Fig. 4B); this is in an agreement with our recent data demonstrating that proteasome inhibition induces p52 accumulation in the nucleus in CTCL cells (50). The κB2 site was occupied predominantly by p65 (Fig. 4C), indicating that the κB2 site is regulated by p65 homodimers (Fig. 4D). 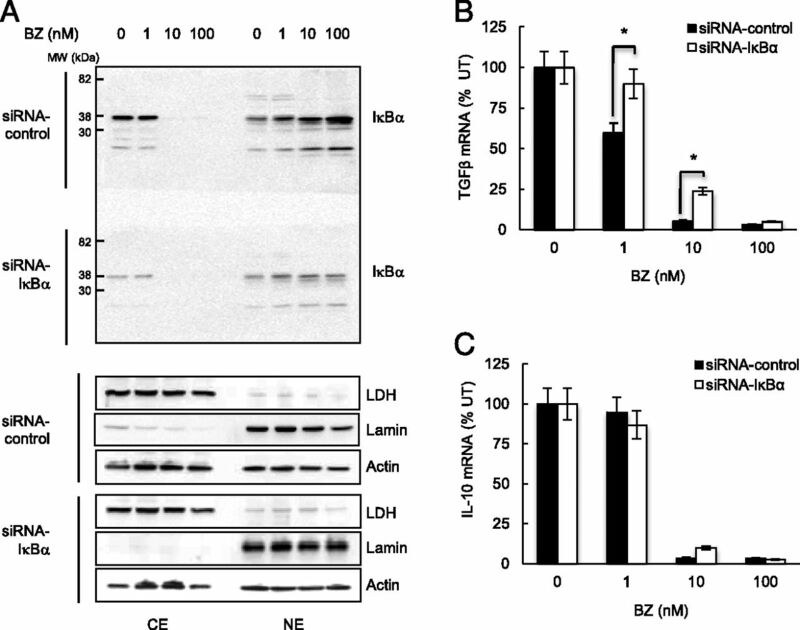 Proteasome inhibition by BZ that decreased the IL-10 expression (Fig. 1), significantly reduced p65 recruitment to the κB2 site, but increased the recruitment of p52 (Fig. 4C, 4D). We did not find any significant recruitment of p65, p50, RelB, cRel, or p52 to the κB3 site (data not shown). These results have indicated that the IL-10 expression is regulated by the IκBα-independent noncanonical pathway, and that the BZ-mediated inhibition of IL-10 expression is associated with increased recruitment of p52 NF-κB that functions as a repressor of IL-10 transcription in CTCL cells (Fig. 4D). IL-10 is regulated by the NF-κB noncanonical pathway in CTCL cells. (A) Schematic illustration of NF-κB binding sites in human IL-10 promoter, and the ChIP primers used in the ChIP assay. Recruitment of NF-κB p65, p50, cRel, RelB, and p52 subunits to the IL-10 κB1 (B) and κB2 (C) sites in Hut-78 cells treated 24 h with 0, 10, and 100 nM BZ was analyzed by ChIP and quantified by real-time PCR. Data are presented as the difference in occupancy of each protein between the κB1 and κB2 sites and the IGX1A negative control locus, and represent the mean ± SE of four experiments. Asterisks denote a statistically significant (*p < 0.05) change compared with control (no BZ) cells. (D) Model of the regulation of IL-10 transcription by the exchange of NF-κB subunits in CTCL cells. In most cell types, TGF-β1 has growth inhibitory and proapoptotic effects; however, in some tumors, TGF-β1 has tumor-promoting effects that include increased cell proliferation, angiogenesis, and metastasis (53, 54). To investigate the TGF-β1 effect on survival and proinflammatory gene expression in CTCL cells, we suppressed TGF-β1 in HH cells that express TGF-β1 in the absence of IL-10 (Fig. 1). HH cells were transfected with control or TGF-β1–specific siRNA, and incubated 24 h with 0, 10, and 100 nM BZ. As expected, suppression of TGF-β1 with siRNA resulted in significantly decreased TGF-β1 mRNA levels (Fig. 5A) and TGF-β1 release (Fig. 5B). Importantly, TGF-β1 suppression significantly decreased the viability of untreated and BZ-treated HH cells (Fig. 5C), indicating that TGF-β1 induces survival in CTCL cells and suggesting that the BZ-induced apoptosis is mediated, at least in part, by the BZ-reduced TGF-β1 levels. To test whether the BZ-induced apoptosis is mediated by the reduced TGF-β1 levels, we evaluated apoptosis by the quantitative cytoplasmic nucleosome release assay. As shown in Fig. 5D, suppression of TGF-β1 by siRNA significantly increased the nucleosome release in untreated and BZ-treated HH cells, indicating that TGF-β1 mediates the spontaneous and BZ-induced apoptosis in CTCL cells. To investigate whether TGF-β1 contributes to the BZ-increased IL-8 and IL-17 expression in CTCL cells (shown in Fig. 1B), we analyzed IL-8 and IL-17 mRNA levels in HH cells transfected with TGF-β1 and control siRNA. As shown in Fig. 5E and 5F, cells transfected with TGF-β1 siRNA exhibited significantly higher IL-8 and IL-17 mRNA levels than cells transfected with control siRNA, indicating that TGF-β1 suppresses IL-8 and IL-17 expression in CTCL cells. TGF-β1 suppression decreases viability and increases proinflammatory gene expression in CTCL cells. HH cells were transfected with control (full columns) or TGF-β1–specific siRNA (empty columns), treated 24 h with 0, 10, and 100 nM BZ, and analyzed for TGF-β1 mRNA expression by real-time RT-PCR (A) and for TGF-β1 release by ELISA (B). (C) Cell viability measured by trypan blue exclusion, and (D) apoptosis analyzed by the cytoplasmic nucleosome enrichment assay in HH cells transfected with control or TGF-β1–specific siRNA. Real time RT-PCR analysis of IL-8 (E) and IL-17 (F) mRNA levels in HH cells transfected with control (full columns) or TGF-β1–specific siRNA (empty columns) and treated 24 h with 0, 10, and 100 nM BZ. Values represent the mean ± SE of four experiments. Asterisks denote a statistically significant (*p < 0.05) change compared with cells transfected with the corresponding control siRNA. The fact that TGF-β1 suppression decreased viability and increased apoptosis, and IL-8 and IL-17 expression also in BZ-untreated cells, indicated that TGF-β1 increases CTCL cell viability and inhibits apoptosis and inflammatory gene expression independently of BZ. To test this hypothesis, we have analyzed cell viability, apoptosis, and IL-8 expression in HH cells transfected with control siRNA (producing ∼350 pg/ml TGF-β1; Fig. 5B) and TGF-β1 siRNA (producing ∼200 pg/ml TGF-β1; Fig. 5B), and incubated with 0, 200, and 400 pg/ml exogenously added rTGF-β1 protein. As shown in Fig. 6A, although addition of TGF-β1 did not have any significant effect on the viability of cells transfected with control siRNA, it increased the viability of TGF-β1 siRNA-transfected cells; addition of 400 pg/ml TGF-β1 reversed the decreased viability in TGF-β1 siRNA-transfected cells. Similarly, exogenously added TGF-β1 decreased apoptosis (Fig. 6B) and IL-8 mRNA expression (Fig. 6C) in TGF-β1 siRNA-transfected cells, although it did not have any significant effect on cells transfected with control siRNA. Exogenous TGF-β1 increases viability of BZ-treated CTCL cells. HH cells were transfected with control (solid columns) or TGF-β1–specific (open columns) siRNA, incubated 24 h with 0, 200, and 400 pg/ml exogenously added rTGF-β1 protein, and analyzed for cell viability (A), cytoplasmic nucleosome enrichment (B), and IL-8 mRNA levels (C). (D) Viability of Hut-78, H9, HH, and PBMC cells incubated 24 h with increasing amounts of exogenously added TGF-β1 protein, in the presence of 100 nM BZ. (A–D) Values represent the mean ± SE of four experiments; asterisks denote a statistically significant (*p < 0.05) change compared with corresponding cells incubated without exogenously added TGF-β1. (E) Western blotting of WCE prepared from untreated Hut-78, H9, HH, and PBMC cells, and analyzed by using TβRI, TβRII, and control actin Abs. (F) Western analysis of TβRI and TβRII protein levels in WCE of HH cells transfected with TβRI, TβRII, or control siRNA. (G) Cell viability and (H) nucleosome enrichment analyzed in HH cells transfected with TβRI, TβRII, or control siRNA, and incubated 24 h with 0, 200, and 400 pg/ml exogenously added TGF-β1. (G and H) Values represent the mean ± SE of four experiments. Asterisks denote a statistically significant change compared with cells transfected with the corresponding control siRNA (*p < 0.05). To determine whether TGF-β1 increases viability also in other CTCL cells, we tested effect of exogenously added rTGF-β1 protein on the viability of untreated and 100 nM BZ-treated Hut-78, H9, and HH cells, as well as normal human PBMCs used as a control. Addition of rTGF-β1 did not have any significant effect on the viability of untreated cells (data not shown); this is consistent with the results demonstrating that TGF-β1 does not affect viability of HH cells transfected with control siRNA (Fig. 6A). Interestingly, addition of exogenous TGF-β1 significantly increased the viability of all three BZ-treated CTCL cells, but decreased the viability of BZ-treated PBMCs (Fig. 6D), indicating that TGF-β1 has an opposing effect on the viability of BZ-treated CTCL cells and normal PBMCs. To examine whether TGF-β1 regulates cell viability through its receptors TβRI and TβRII, we have analyzed TβRI and TβRII protein levels in CTCL cells and in PBMCs, and tested whether TβRI and TβRII suppression decreases CTCL cell viability and whether addition of exogenous TGF-β1 reverses this effect. As shown in Fig. 6E, all three CTCL cells, as well as PBMCs, express both TβRI and TβRII, even though the protein expression of both receptors is lower in Hut-78 and HH cells compared with H9 cells. Importantly, suppression of TβRI and TβRII in HH cells with siRNA (Fig. 6F) significantly decreased cell viability (Fig. 6G) and increased apoptosis (Fig. 6H), and addition of exogenous rTGF-β1 reversed these effects, suggesting that TGF-β1 induces CTCL cell survival through the TβRI/TβRII signaling. Advanced stages of CTCL and skin accumulation of malignant T cells have been associated with the increased expression of the chemokine receptor CXCR4 (11–14). Because previous studies have shown that TGF-β1 can increase the CXCR4 expression on T cells (55–57), we hypothesized that proteasome inhibition, by reducing the TGF-β1 levels, might inhibit the CXCR4 expression in CTCL cells. First, we analyzed the CXCR4 mRNA levels in CTCL Hut-78 and HH cells incubated 24 h with 0, 10, and 100 nM BZ. As shown in Fig. 7A, BZ significantly decreased the CXCR4 mRNA levels in both CTCL cells; 10 nM BZ decreased the CXCR4 mRNA expression in Hut-78 cells by ∼25% and in HH cells by 90%. A total of 100 nM BZ decreased CXCR4 mRNA levels in both cell types by ∼90%. BZ also substantially reduced the CXCR4 protein levels in Hut-78 and HH cells (Fig. 7B). Again, the CXCR4 protein levels were more affected by 10 nM BZ in HH cells than in Hut-78 cells (Fig. 7B), correlating with the mRNA data (Fig. 7A). BZ inhibits CXCR4 expression and migration of CTCL cells. (A) Real-time RT-PCR analysis of CXCR4 mRNA levels in Hut-78 (solid columns) and HH (open columns) cells treated 24 h with 0, 10, and 100 nM BZ. Values represent the mean ± SE of four experiments. Asterisks denote a statistically significant (*p < 0.05) inhibition compared with untreated cells. (B) Western analysis of CXCR4 protein levels in WCE prepared from Hut-78 and HH cells treated 24 h with 0, 10, and 100 nM BZ. Equal protein loading was confirmed by reprobing the membranes with anti-actin Ab. (C) Real-time RT-PCR of CXCR4 mRNA levels in HH cells transfected with control (solid columns) or TGF-β1–specific (open columns) siRNA and treated 24 h with 0, 10, and 100 nM BZ. Values represent the mean ± SE of four experiments. Asterisk denotes a statistically significant change compared with cells transfected with control siRNA (*p < 0.05). (D) Western analysis of WCE prepared from HH cells transfected with control or TGF-β1 siRNA, treated 24 h with 0, 10, and 100 nM BZ, and analyzed by using CXCR4 and actin Abs. (E) Migration assay of Hut-78 and HH cells incubated 6 h with 0, 10, and 100 nM BZ. Results are expressed as migration index that represents the ratio between the number of cells that migrated in the presence of BZ and the number of migrated untreated cells. Values represent the mean ± SE of four experiments. Asterisks denote a statistically significant inhibition compared with untreated cells (*p < 0.05). (F) Migration assay of HH cells transfected with control (solid columns) or TGF-β1–specific (open columns) siRNA and treated 6 h with 0, 10, and 100 nM BZ. Results are expressed as migration index representing the ratio between the number of cells migrating in the presence of BZ and the number of untreated migrating cells; the values represent the mean ± SE of four experiments. Asterisks denote a statistically significant change compared with cells transfected with control siRNA (*p < 0.05). To determine whether the CXCR4 expression in CTCL cells is mediated by TGF-β1, we examined the CXCR4 expression in HH cells transfected with control and TGF-β1 siRNA. 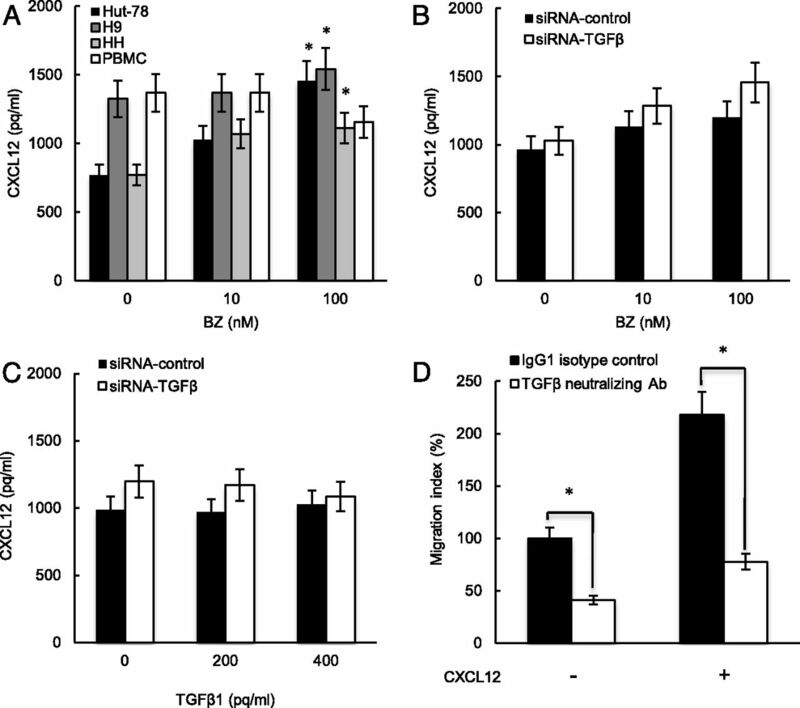 TGF-β1 suppression significantly reduced both the CXCR4 mRNA (Fig. 7C) and protein levels (Fig. 7D) in HH cells, demonstrating that the CXCR4 expression in CTCL cells is mediated by TGF-β1 and suggesting that TGF-β1 might promote CTCL cell migration. Because CXCR4 controls T cell trafficking (58), we hypothesized that suppression of CXCR4 by the BZ-reduced TGF-β1 expression in CTCL cells might decrease their migration potential. First, we tested whether BZ inhibits migration of Hut-78 and HH cells. As shown in Fig. 7E, migration of Hut-78 and HH cells was significantly decreased by 10 and 100 nM BZ compared with untreated cells. Correlating with the CXCR4 expression (Fig. 7A), 10 nM BZ reduced migration of Hut-78 cells by ∼30% and of HH cells by ∼80% (Fig. 7E); 100 nM BZ decreased migration of both cell types by 80–90% (Fig. 7E). To examine whether the decreased migration of BZ-treated cells is mediated by the reduced TGF-β1 levels, we suppressed TGF-β1 expression in HH cells by siRNA and measured their migration after 6-h treatment with 0, 10, and 100 nM BZ. Suppression of TGF-β1 significantly reduced migration of untreated HH cells (Fig. 7F), strongly indicating that TGF-β1 promotes CTCL cell migration. TGF-β1 suppression decreased the cell migration also in BZ-treated cells (Fig. 7F), suggesting that the BZ-inhibited CTCL cell migration may be mediated, at least in part, by the reduced TGF-β1 levels. Because CXCL12 is the major ligand for CXCR4, we wanted to determine whether CXCL12 is released by CTCL cells, whether its expression is regulated by BZ and mediated by TGF-β1, and whether it induces migration of CTCL cells. All three CTCL lines, as well as normal PBMCs, release considerable amounts of CXCL12 (Fig. 8A). Interestingly, however, although 100 nM BZ significantly increases CXCL12 release from all three CTCL cells, it reduces CXCL12 release from PBMCs (Fig. 8A). Suppression of endogenous TGF-β1 by siRNA (Fig. 8B) or addition of exogenous TGF-β1 (Fig. 8C) did not have any significant effect on the CXCL12 release from HH cells, indicating that the CXCL12 expression is not dependent on TGF-β1 in CTCL cells. TGF-β1 and CXCL12 promote CTCL cell migration. (A) CXCL12 release measured in Hut-78, H9, HH, and PBMC cells incubated 24 h with 0, 10, and 100 nM BZ. Asterisks denote a statistically significant (*p < 0.05) change compared with untreated cells. (B) CXCL12 release measured in HH cells transfected with control or TGF-β1–specific siRNA, and incubated 24 h with 0, 10, and 100 nM BZ. (C) CXCL12 release measured in control and TGF-β1 siRNA-transfected HH cells, and incubated 24 h with 0, 200, and 400 pg/ml exogenously added rTGF-β1. (D) Migration assay of HH cells incubated 6 h with 300 ng/ml TGF-β neutralizing Ab (open columns) or control IgG (solid columns) in the absence and presence of 50 ng/ml CXCL12 added to the lower chamber. Values represent the mean ± SE of four experiments; asterisks denote a statistically significant (*p < 0.05) change compared with cells incubated with control Ab. To determine whether TGF-β1 and CXCL12 induce CTCL migration, we analyzed migration of serum-starved HH cells toward serum and CXCL12 (50 ng/ml), in the presence of 300 ng/ml TGF-β neutralizing Ab, or isotype control IgG. As shown in Fig. 8D, TGF-β neutralizing Ab significantly reduced the HH cell migration both in the absence and in the presence of CXCL12 added to the lower chamber. Furthermore, CXCL12 increased the HH cell migration >2-fold (Fig. 8D). Together, these results strongly indicate that TGF-β1 and CXCL12 induce migration of CTCL cells (Fig. 9). Proposed model of TGF-β1 and IL-10 function and regulation in CTCL cells. In CTCL cells, proteasome inhibition by BZ inhibits expression of the NF-κB–dependent immunosuppressive cytokines IL-10 and TGF-β1. However, whereas the TGF-β1 expression is regulated by the IκBα-dependent canonical pathway, the IL-10 expression is regulated by the IκBα-independent noncanonical pathway. Suppression of TGF-β1 in CTCL cells induces apoptosis and IL-8 and IL-17 expression, whereas concomitantly inhibiting CXCR4 expression and CTCL migration. Progression of CTCL has been associated with the increased expression of TGF-β1 and IL-10 that are believed to be responsible for the suppressed immunity, increased susceptibility to infections, and diminished antitumor responses. Yet, little is known about the transcriptional regulation of TGF-β1 and IL-10 in CTCL, and about their function in regulating the CTCL cell responses. In this article, we show that both TGF-β1 and IL-10 expression in CTCL cells are regulated by the NF-κB pathway and suppressed by BZ-mediated proteasome inhibition. However, although the TGF-β1 expression is IκBα dependent and is regulated by the canonical pathway, IL-10 expression is IκBα independent and its inhibition is associated with the increased promoter recruitment of p52 that characterizes the noncanonical pathway. Interestingly, our data show that TGF-β1 has the opposite effect on the viability of BZ-treated cells: although it enhances the viability of CTCL cells, it decreases the viability of normal PBMCs. 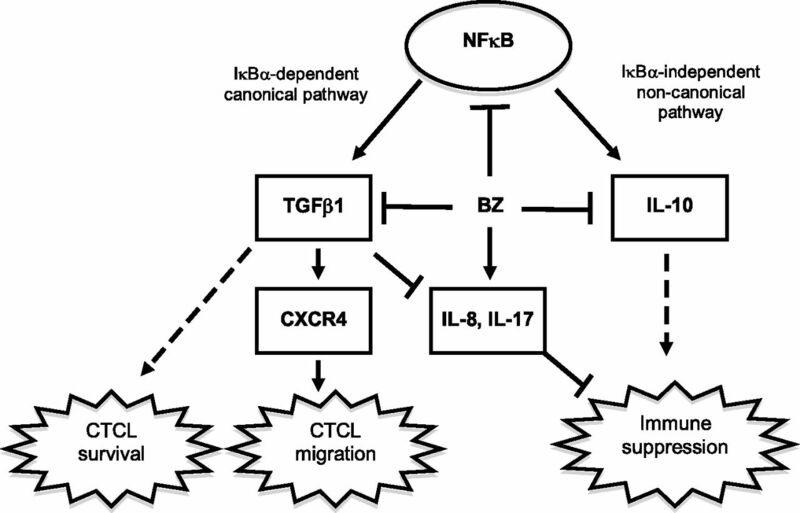 TGF-β1 suppression increases IL-8 and IL-17 expression in untreated and BZ-treated CTCL cells, indicating that TGF-β1 inhibits the proinflammatory gene expression in CTCL cells. Furthermore, our results show that TGF-β1 mediates CXCR4 expression and CXCL12-induced CTCL cell migration, and that BZ inhibits the CXCR4 expression and CTCL cell migration (Fig. 9). BZ is the first clinically approved proteasome inhibitor that has been very effective in the treatment of MM and has shown promising results also in patients with relapsed or refractory CTCL (37–42). However, the mechanisms of BZ function in CTCL remain incompletely understood. Previous studies from our laboratory have shown that BZ induces CTCL cell apoptosis by inhibiting expression of the antiapoptotic genes cIAP1 and cIAP2 and the proto-oncogene Bcl3, whereas it concomitantly induces release of the proinflammatory cytokines IL-8 and IL-17, and increases their release levels to those seen in healthy adults (47, 50). In this study, we show that BZ inhibits TGF-β1 and IL-10 expression, CXCR4 levels, and CTCL cell migration, indicating that this may represent an additional mechanism of BZ function in CTCL. Our data indicate that the BZ-induced IL-8 and IL-17 expression is mediated, at least partly, by the BZ-inhibited TGF-β1 release, because TGF-β1 suppression enhances the IL-8 and IL-17 expression in BZ-treated CTCL cells. However, because TGF-β1 suppression increases IL-8 and IL-17 mRNA levels also in BZ-untreated cells (Fig. 5E, 5F), these results indicate that TGF-β1 inhibits the proinflammatory gene expression in CTCL cells independently of BZ. The mechanisms by which TGF-β1 inhibits the proinflammatory gene expression in CTCL cells are currently under investigation. The increased IL-8 and IL-17 mRNA levels observed after TGF-β1 suppression are compatible with decreased transcription; however, it is also possible that TGF-β1 regulates IL-8 and IL-17 mRNA stability. Even though TGF-β1 inhibits survival and proliferation in most cells, some tumor cells become unresponsive to the antiproliferative effect of TGF-β1, and some actually switch to being stimulated by TGF-β1 (53, 54). Interestingly, our data show that TGF-β1 increases viability of BZ-treated CTCL cells, whereas it decreases viability of BZ-treated PBMCs (Fig. 6D). Intriguingly, however, this opposing effect on cell viability is observed only in BZ-treated cells (Fig. 6D); TGF-β1 has no effect on CTCL or PBMC cell viability when it is added to untreated cells (data not shown). This is consistent with results shown in Fig. 6A–C, demonstrating that exogenous TGF-β1 increases viability and decreases apoptosis and IL-8 expression in HH cells transfected with TGF-β1 siRNA, but not control siRNA. Because both 100 nM BZ and TGF-β1 siRNA suppression decrease the released TGF-β1 levels in HH cells to ∼150–200 pg/ml (Figs. 1A and 5B), these results suggest that cells are responsive to exogenously added TGF-β1 only when the endogenous TGF-β1 levels are reduced. Several signaling mechanisms may be responsible for this “saturation” effect; however, the TGF-β1 receptors, TβRI and TβRII, seem to be among the most plausible candidates. Several studies have shown that CTCL patients have decreased expression of TβRI and/or TβRII, and reduced responsiveness to the growth-inhibitory effects of TGF-β1 (59–64). We have detected TβRI and TβRII in all three CTCL lines, even though Hut-78 and HH cells express considerably lower protein levels of both receptors than H9 cells (Fig. 6E). Because transfection of HH cells with TβRI and TβRII siRNA decreased their viability and increased apoptosis, and addition of exogenous TGF-β1 reversed these effects (Fig. 6F–H), these data suggest that the TGF-β1 receptors in HH cells are, at least partially, functional. However, because CTCL cells respond to exogenously added TGF-β1 only when the endogenous TGF-β1 levels are suppressed by TGF-β1 siRNA (Fig. 6A–C), or BZ (Fig. 6D), it is possible that the TGF-β1 receptors in CTCL cells are saturated by the high levels of endogenous TGF-β1, and respond to exogenously added TGF-β1 only when the endogenous levels are decreased. In this respect, BZ might have a previously unrecognized effect on the viability of CTCL cells that is mediated by the reduced TGF-β1 levels. However, because this study used only CTCL established cell lines, and not primary Sézary cells, it will be important in the future to determine whether the same mechanisms are operational in primary Sézary cells as well. Particularly, it would be interesting to investigate whether primary Sézary cells from BZ-treated patients have functional TGF-β1 receptors and signaling. 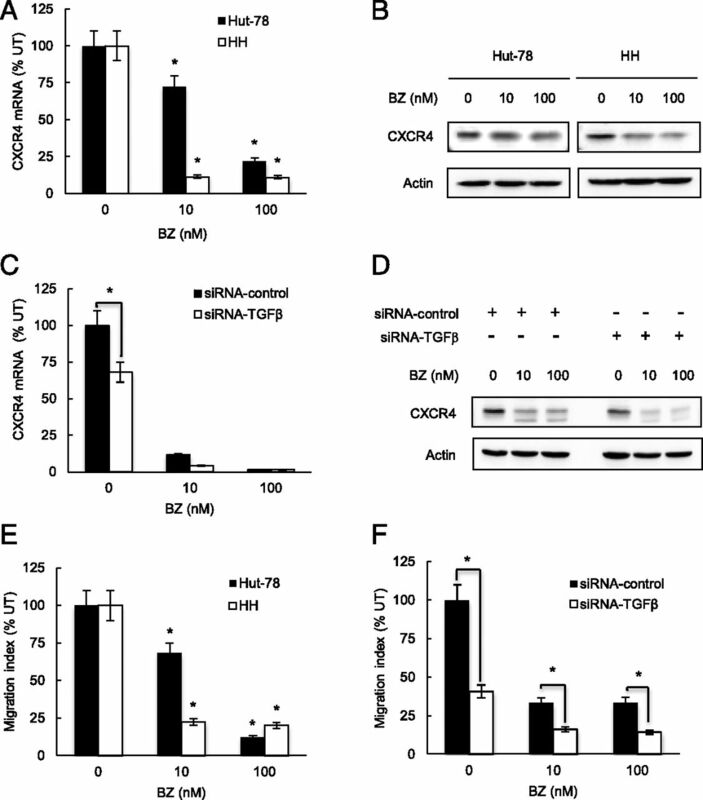 Importantly, in addition to the inhibition of TGF-β1 and IL-10, BZ inhibits mRNA and protein expression of the chemokine receptor CXCR4 in CTCL Hut-78 and HH cells (Fig. 7A, 7B). 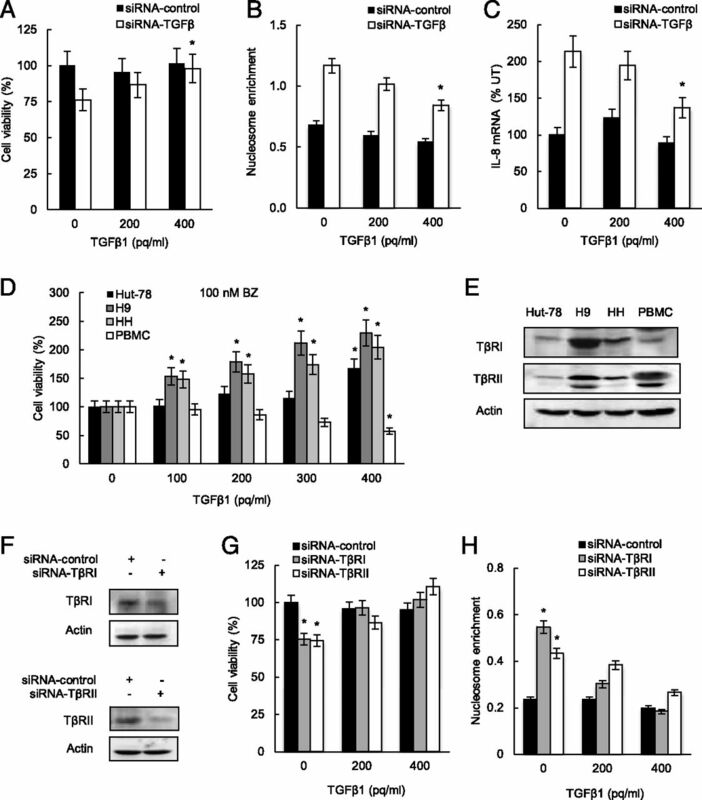 Because TGF-β1 suppression decreases CXCR4 mRNA and protein levels in CTCL cells (Fig. 7C, 7D), these data indicate that TGF-β1 induces the CXCR4 expression in CTCL cells, and that the BZ-decreased CXCR4 expression is at least partly mediated by TGF-β1. The proposed BZ inhibition of CXCR4 via TGF-β1 signaling is further supported by studies demonstrating that BZ decreases CXCR4 expression in BZ-resistant mouse MM cell lines, whereas it does not inhibit CXCR4 expression in cells that do not express detectable levels of TGF-β1 (65–67). Because the increased CXCR4 expression has been implicated in promoting skin homing of malignant CTCL cells in patients with SS (12), these findings suggest that the BZ-reduced TGF-β1–CXCR4 signaling may represent yet another mechanism responsible for the BZ function in CTCL. Indeed, we have found that BZ significantly reduces migration of CTCL cells (Fig. 7E), and that TGF-β1 suppression decreases HH cell migration (Fig. 7F), indicating that TGF-β1 induces migration of CTCL cells, and suggesting that BZ inhibits the CTCL cell migration by inhibiting TGF-β1 expression. The role of TGF-β1 in inducing migration of CTCL cells is further supported by our data demonstrating that addition of TGF-β neutralizing Ab significantly decreases migration of HH cells, both in the absence and in the presence of CXCL12 (Fig. 8D). Our data show that all three CTCL lines release considerable levels of CXCL12. However, in contrast with CXCR4, which is inhibited by BZ and dependent on TGF-β1, the CXCL12 release is increased by 100 nM BZ in CTCL cells (Fig. 8A), and its expression is not regulated by TGF-β1 (Fig. 8B, 8C). Because CXCL12 is a potent chemoattractant for lymphocytes, these results suggest that BZ suppresses migration of CTCL cells through the decreased autocrine TGF-β1–CXCR4 signaling, although it may concomitantly increase recruitment of nonmalignant lymphocytes by the increased CXCL12 release from CTCL cells. It will be interesting to determine in the future whether this is indeed the case in BZ-treated CTCL patients. In cancer cells, the immunosuppressive cytokines TGF-β1 and IL-10 are thought to be responsible for the suppression of antitumor immune responses and successful tumor escape (68, 69). Our data indicate that, in CTCL, TGF-β1 inhibits apoptosis, blocks IL-8 and IL-17 expression, and promotes CXCR4 expression and CTCL cell migration. Thus, understanding the mechanisms regulating TGF-β1 and IL-10 expression in CTCL cells will likely reveal novel pathways that could be targeted for therapy. Our data demonstrate that the TGF-β1 expression in CTCL cells is IκBα dependent (Fig. 2) and correlates with the p65/p50 occupancy at the TGF-β1 promoter (Fig. 3), indicating that the TGF-β1 expression is regulated by the canonical pathway. In contrast, the IL-10 expression is IκBα independent (Fig. 2); correlates with p65, p50, and RelB occupancy at the IL-10 promoter; and inversely correlates with p52 recruitment (Fig. 4). The high p65, p50, and RelB occupancy at the IL-10 promoter and the increased p52 recruitment in BZ-treated cells are consistent with our recent study demonstrating high levels of p65, p50, and RelB in the nucleus of CTCL cells and increased p52 nuclear accumulation in response to proteasome inhibition (50). These results indicate that the IL-10 expression is regulated by the noncanonical pathway, and suggest that p52 acts as a transcriptional repressor of the IL-10 expression in CTCL cells. Even though p52 lacks the transactivation domain, it can stimulate transcription by forming complexes with p65, or repress transcription by forming inactive p52/p52 homodimers (70–72), or associating with histone deacetylases (73, 74). Our data suggest that the κB1 and κB2 sites of the IL-10 promoter in BZ-treated CTCL cells are occupied by p52 homodimers (Fig. 4); however, it seems plausible that additional recruited transcriptional regulators, such as histone deacetylases (73, 74) or the nuclear oncoprotein Bcl3 (50), may contribute to the p52-mediated inhibition of IL-10 expression in CTCL cells. In conclusion, our study provides a novel insight into the BZ function in CTCL and demonstrates that, in addition to inducing apoptosis, BZ has an important immunomodulatory role by downregulating expression of the immunosuppressive cytokines TGF-β1 and IL-10, whereas concomitantly increasing expression of IL-8, IL-17, and CXCL12. Our data show that TGF-β1 regulates the CXCR4 expression and CTCL cell migration, and suggest that it might represent a useful tool to interfere with tumor progression in CTCL and other malignancies characterized by excessive TGF-β1 expression. This work was supported by National Institutes of Health Grants AI085497 and CA173452 (to I.V.).
. 2004. The life cycle of cutaneous T cell lymphoma reveals opportunities for targeted drug therapy. Curr. Cancer Drug Targets 4: 609–619.
. 2000. Functional characterization of an IL-7-dependent CD4(+)CD8alphaalpha(+) Th3-type malignant cell line derived from a patient with a cutaneous T-cell lymphoma. Blood 96: 1056–1063.
. 2008. Gamma c-signaling cytokines induce a regulatory T cell phenotype in malignant CD4+ T lymphocytes. J. Immunol. 181: 2506–2512.
. 2008. Malignant Tregs express low molecular splice forms of FOXP3 in Sézary syndrome. Leukemia 22: 2230–2239.
. 2005. Immunopathogenesis and therapy of cutaneous T cell lymphoma. J. Clin. Invest. 115: 798–812.
. 2006. A role for regulatory T cells in cutaneous T-Cell lymphoma; induction of a CD4 + CD25 + Foxp3+ T-cell phenotype associated with HTLV-1 infection. J. Invest. Dermatol. 126: 690–692.
. 2008. Immune function abnormalities in peripheral blood mononuclear cell cytokine expression differentiates stages of cutaneous T-cell lymphoma/mycosis fungoides. Clin. Cancer Res. 14: 646–653.
. 2011. The role of cytokine signaling in the pathogenesis of cutaneous T-cell lymphoma. Cancer Biol. Ther. 12: 1019–1022.
. 2012. Regulatory T cells and immunodeficiency in mycosis fungoides and Sézary syndrome. Leukemia 26: 424–432.
. 2003. Chemokine receptor expression on neoplastic and reactive T cells in the skin at different stages of mycosis fungoides. J. Invest. Dermatol. 121: 1045–1052.
. 2006. Skin homing of Sézary cells involves SDF-1-CXCR4 signaling and down-regulation of CD26/dipeptidylpeptidase IV. Blood 107: 1108–1115.
. 2009. Cutaneous T-cell lymphoma: roles for chemokines and chemokine receptors. J. Invest. Dermatol. 129: 1115–1119.
. 2014. Expression dynamics of CXCL12 and CXCR4 during the progression of mycosis fungoides. Br. J. Dermatol. 171: 722–731.
. 1997. Activation of the interleukin-10 gene in the human T lymphoma line HuT 78: identification and characterization of NF-κ B binding sites in the regulatory region of the interleukin-10 gene. Eur. J. Haematol. 59: 162–170.
. 2006. NF-kappaB1 (p50) homodimers differentially regulate pro- and anti-inflammatory cytokines in macrophages. J. Biol. Chem. 281: 26041–26050.
. 2008. Interleukin-10: new perspectives on an old cytokine. Immunol. Rev. 226: 205–218.
. 2014. The regulation of IL-10 expression. Curr. Top. Microbiol. Immunol. 380: 157–190.
. 2006. NF-kappaB and activator protein 1 response elements and the role of histone modifications in IL-1β-induced TGF-β1 gene transcription. J. Immunol. 176: 603–615.
. 2010. Cellular and molecular basis for the regulation of inflammation by TGF-β. J. Biochem. 147: 781–792.
. 2002. Two pathways to NF-kappaB. Mol. Cell 10: 693–695.
. 2011. A single NFκB system for both canonical and non-canonical signaling. Cell Res. 21: 86–102.
. 2006. Transcriptional regulation via the NF-kappaB signaling module. Oncogene 25: 6706–6716.
. 2010. The nuclear signaling of NF-kappaB: current knowledge, new insights, and future perspectives. Cell Res. 20: 24–33. 2012. Dimer-specific regulatory mechanisms within the NF-κB family of transcription factors. Immunol. Rev. 246: 193–204.
. 1995. Autocrine regulation of the transcription factor NF κ B by TNF α in the human T cell lymphoma line Hut 78. Biochem. Soc. Trans. 23: 113S.
. 1995. Cellular proliferation and activation of NF kappa B are induced by autocrine production of tumor necrosis factor alpha in the human T lymphoma line HuT 78. J. Biol. Chem. 270: 7399–7404.
. 1998. Constitutive activation of NF-kappaB causes resistance to apoptosis in human cutaneous T cell lymphoma HuT-78 cells. Autocrine role of tumor necrosis factor and reactive oxygen intermediates. J. Biol. Chem. 273: 14008–14014.
. 2000. Constitutive expression of NF-κ B is a characteristic feature of mycosis fungoides: implications for apoptosis resistance and pathogenesis. Hum. Pathol. 31: 1482–1490.
. 2006. Down-regulating constitutive activation of the NF-kappaB canonical pathway overcomes the resistance of cutaneous T-cell lymphoma to apoptosis. Blood 107: 2354–2363.
. 2008. Inhibition of IkappaB kinase subunit 2 in cutaneous T-cell lymphoma down-regulates nuclear factor-kappaB constitutive activation, induces cell death, and potentiates the apoptotic response to antineoplastic chemotherapeutic agents. Clin. Cancer Res. 14: 901–911.
. 2005. The spectrum of cutaneous T-cell lymphomas: new insights into biology and therapy. Curr. Opin. Hematol. 12: 273–278.
. 2011. Evolving insights in the pathogenesis and therapy of cutaneous T-cell lymphoma (mycosis fungoides and Sezary syndrome). Br. J. Haematol. 155: 150–166. 2011. Cutaneous T-cell lymphoma: 2011 update on diagnosis, risk-stratification, and management. Am. J. Hematol. 86: 928–948.
. 2012. Management of cutaneous T cell lymphoma: new and emerging targets and treatment options. Cancer Manag Res 4: 75–89.
. 2012. Cutaneous T-cell lymphomas: a review of new discoveries and treatments. Curr. Treat. Options Oncol. 13: 102–121. Jawed, S. I., P. L. Myskowski, S. Horwitz, A. Moskowitz, and C. Querfeld. 2014. Primary cutaneous T-cell lymphoma (mycosis fungoides and Sézary syndrome): part I. Diagnosis: clinical and histopathologic features and new molecular and biologic markers. J. Am. Acad. Dermatol. 70: 205.e1–e16.
. 2001. The proteasome inhibitor PS-341 inhibits growth, induces apoptosis, and overcomes drug resistance in human multiple myeloma cells. Cancer Res. 61: 3071–3076.
. 2009. Proteasome inhibitors in the treatment of multiple myeloma. Leukemia 23: 1964–1979.
. 2007. Phase II trial of proteasome inhibitor bortezomib in patients with relapsed or refractory cutaneous T-cell lymphoma. J. Clin. Oncol. 25: 4293–4297. 2008. Novel therapies for cutaneous T-cell lymphomas. Clin. Lymphoma Myeloma 8(Suppl. 5): S187–S192.
. 2009. Synergistic interaction of the histone deacetylase inhibitor SAHA with the proteasome inhibitor bortezomib in cutaneous T cell lymphoma. Eur. J. Haematol. 82: 440–449.
. 2012. Bortezomib in combination with CHOP as first-line treatment for patients with stage III/IV peripheral T-cell lymphomas: a multicentre, single-arm, phase 2 trial. Eur. J. Cancer 48: 3223–3231.
. 2012. miR-122 regulates p53/Akt signalling and the chemotherapy-induced apoptosis in cutaneous T-cell lymphoma. PLoS ONE 7: e29541.
. 2013. Proteasome inhibition as a novel mechanism of the proapoptotic activity of γ-secretase inhibitor I in cutaneous T-cell lymphoma. Br. J. Dermatol. 168: 504–512.
. 2011. Bortezomib induces nuclear translocation of IκBα resulting in gene-specific suppression of NF-κB—dependent transcription and induction of apoptosis in CTCL. Mol. Cancer Res. 9: 183–194.
. 2013. Proteasome inhibition by bortezomib increases IL-8 expression in androgen-independent prostate cancer cells: the role of IKKα. J. Immunol. 191: 2837–2846.
. 2014. Proteasome inhibition increases recruitment of IκB kinase β (IKKβ), S536P-p65, and transcription factor EGR1 to interleukin-8 (IL-8) promoter, resulting in increased IL-8 production in ovarian cancer cells. J. Biol. Chem. 289: 2687–2700.
. 2014. Bcl3 regulates pro-survival and pro-inflammatory gene expression in cutaneous T-cell lymphoma. Biochim. Biophys. Acta 1843: 2620–2630.
. 2014. 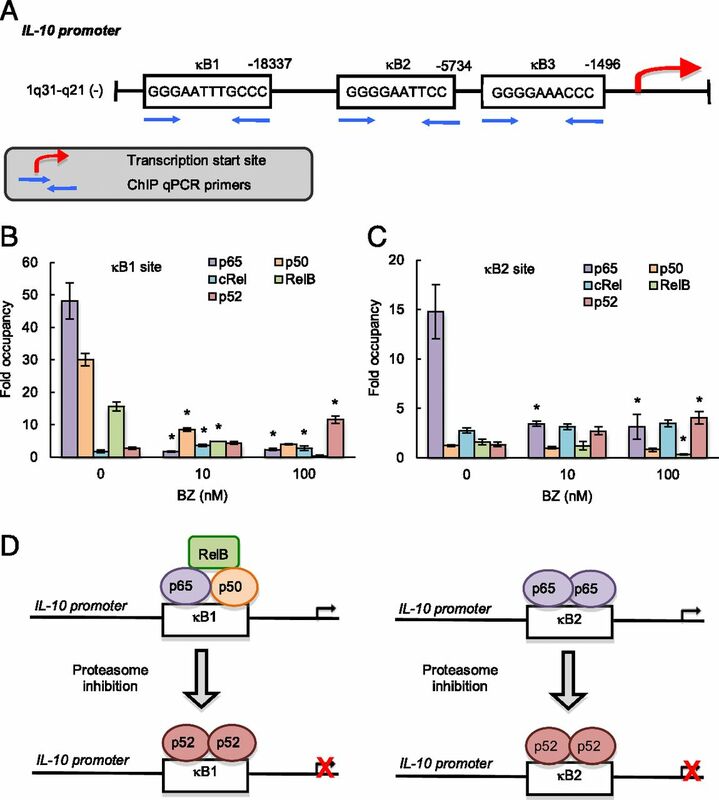 Analysis of TGFβ1 and IL-10 transcriptional regulation in CTCL cells by chromatin immunoprecipitation. Methods Mol. Biol. 1172: 329–341.
. 1999. Proteasome inhibitors: a novel class of potent and effective antitumor agents. Cancer Res. 59: 2615–2622.
. 2005. TGF-β directly targets cytotoxic T cell functions during tumor evasion of immune surveillance. Cancer Cell 8: 369–380.
. 2003. Cytostatic and apoptotic actions of TGF-β in homeostasis and cancer. Nat. Rev. Cancer 3: 807–821.
. 1998. Flexible programs of chemokine receptor expression on human polarized T helper 1 and 2 lymphocytes. J. Exp. Med. 187: 875–883.
. 2000. Persistent induction of the chemokine receptor CXCR4 by TGF-β 1 on synovial T cells contributes to their accumulation within the rheumatoid synovium. J. Immunol. 165: 3423–3429.
. 2002. TGF-β1 enhances SDF-1alpha-induced chemotaxis and homing of naive T cells by up-regulating CXCR4 expression and downstream cytoskeletal effector molecules. Eur. J. Immunol. 32: 193–202.
. 2001. Lymphocyte traffic control by chemokines. Nat. Immunol. 2: 123–128.
. 2013. Lessons learned from gene expression profiling of cutaneous T-cell lymphoma. Br. J. Dermatol. 169: 1188–1197.
. 1994. Loss of receptors for transforming growth factor beta in human T-cell malignancies. Proc. Natl. Acad. Sci. USA 91: 6002–6006.
. 1995. Reduced surface expression of transforming growth factor beta receptor type II in mitogen-activated T cells from Sézary patients. Proc. Natl. Acad. Sci. USA 92: 5501–5505.
. 1996. A dominant inhibitory mutant of the type II transforming growth factor beta receptor in the malignant progression of a cutaneous T-cell lymphoma. Mol. Cell. Biol. 16: 3480–3489.
. 2004. Aberrant expression of the tyrosine kinase receptor EphA4 and the transcription factor twist in Sézary syndrome identified by gene expression analysis. Cancer Res. 64: 5578–5586.
. 2011. Sézary syndrome cells overexpress syndecan-4 bearing distinct heparan sulfate moieties that suppress T-cell activation by binding DC-HIL and trapping TGF-beta on the cell surface. Blood 117: 3382–3390.
. 2009. CDK2 phosphorylation of Smad2 disrupts TGF-β transcriptional regulation in resistant primary bone marrow myeloma cells. J. Immunol. 182: 1810–1817.
. 2009. CXCR4 inhibitor AMD3100 disrupts the interaction of multiple myeloma cells with the bone marrow microenvironment and enhances their sensitivity to therapy. Blood 113: 4341–4351.
. 2013. Reduced CXCR4 expression is associated with extramedullary disease in a mouse model of myeloma and predicts poor survival in multiple myeloma patients treated with bortezomib. Leukemia 27: 2075–2077. 2014. Regulatory T cell subsets in human cancer: are they regulating for or against tumor progression? Cancer Immunol. Immunother. 63: 67–72.
. 2013. Beyond TGFβ: roles of other TGFβ superfamily members in cancer. Nat. Rev. Cancer 13: 328–341.
. 1994. Mechanism of expression and role in transcriptional control of the proto-oncogene NFKB-2/LYT-10. Oncogene 9: 923–933.
. 1994. Rearranged NFKB2 gene in the HUT78 T-lymphoma cell line codes for a constitutively nuclear factor lacking transcriptional repressor functions. Oncogene 9: 1931–1937.
. 1992. Distinct combinations of NF-κ B subunits determine the specificity of transcriptional activation. Proc. Natl. Acad. Sci. USA 89: 1529–1533.
. 2003. p53 represses cyclin D1 transcription through down regulation of Bcl-3 and inducing increased association of the p52 NF-kappaB subunit with histone deacetylase 1. Mol. Cell. Biol. 23: 4713–4727.
. 2012. A noncanonical Flt3ITD/NF-κB signaling pathway represses DAPK1 in acute myeloid leukemia. Clin. Cancer Res. 18: 360–369.